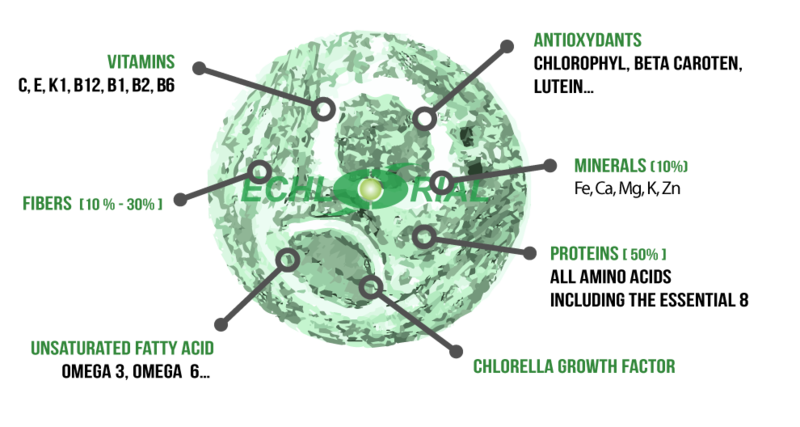 The effects of Chlorella are linked to the properties of its many components. Every component offers its own valuable health benefits. Moreover, the power of Chlorella’s effects can likely be attributed to the synergy of these components. Because all of Chlorella’s components work together in synergy, their beneficial properties are exponentially more powerful than they are when taken separately. Chlorella contains CGF, the well-known growth factor that gives the plant its exceptional reparative abilities and enables it to aid in development. It is thanks to CGF that Chlorella is able to stimulate the production and reconstruction of our body’s tissues. The high concentration of proteins and the many essential amino acids in Chlorella facilitate cellular metabolism. For example, Chlorella contains the essential amino acid tryptophan (around 3 mg/g dried Chlorella). Because the human body does not naturally produce tryptophan, we must obtain it through our diet instead. The amino acid enables the production of serotonin, which is often called “the happiness hormone” because of its important role in physical and mental development and overall wellbeing. Because of the fibrous structure of its membrane, Chlorella acts as an excellent digestive agent and helps prevent constipation. The fiber in Chlorella also enables it to bind to toxins in the body, including heavy metals such as mercury, lead, cadmium, and aluminum. Since our bodies cannot absorb the fiber, it is excreted from the body along with the toxins. Thus, the fiber effectively detoxifies our system while also stimulating digestive functioning. This process demonstrates how Chlorella serves as a purifying or detoxifying agent. Chlorella contains polyunsaturated fatty acids such as linoleic and linolenic acids, which are used in therapeutic treatments in Western medicine. Medications that contain these fatty acids are prescribed to treat certain cardiovascular diseases and a variety of skin inflammations. The mineral and elemental components of Chlorella (such as potassium, calcium, magnesium, iron, zinc, and selenium) are indispensable to the metabolic reactions in our cells. They also help build strong and healthy bones, teeth, and nails by providing support during their construction. Chlorophyll is known for its cleansing abilities and is therefore strongly recommended during detoxification treatments. Carotenoids are known for their ability to protect the skin and also for their role in preventing age-related macular degeneration (ARMD), according to recent studies of beta-carotene and lutein published by the French Institute of Health and Medical Research (Institut national de la santé et de la recherche médicale, or INSERM). Other antioxidants in Chlorella offer beneficial effects, too. Phenolic acids (such as salicylic acid [vitamin C], caffeic acid, and cinnamic acid) can act as analgesics and anti-inflammatories, and phytosterols (such as ergosterol and its derivatives) are known for their anti-cholesterol and anti-inflammatory effects. Chlorella contains many vitamins. Vitamin E and carotenoids improve the resistance of cells to aging due to free radicals. Vitamins B1, B2, B6, B12, K, and C are also essential to the proper functioning of our bodies. For example, vitamin B12 plays an important role in cellular growth. Because this vitamin is only found in meat and a few plants (such as some microalgae), those following a vegetarian or vegan diet often have to take B12 supplements. Three grams of Chlorella meets our daily need for vitamin B12.